The rain cleared, the wind dropped, and the sun shone as Ponteland’s parade of youth organisations, lead by the RAF, reached the Memorial on Darras Road. 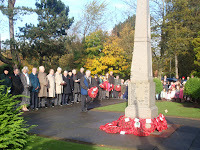 The weather did not deter a substantial crowd of all ages attending to hear the service lead by Ponteland’s four clergy and to remember those who fought for their country and did not return. As the Last Post sounded many present had their own memories of relatives or friends as well as paying tribute to the names on the Memorial. Wreath laying was led by the Deputy Lord Lieutenant, Lady Bradbury, followed by members of the village organisations. 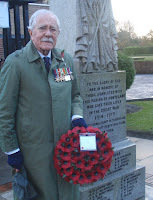 Among those was Tom Hughes, former Spitfire pilot, who has attended the Ponteland service for many years. He became a pilot before he was nineteen, achieved his ambition to fly Spitfires and was in Malta as part of the build up to cover the invasion of Sicily. The mission was accomplished and Tom was flying a captured Messerschmitt when he crashed the plane but he managed to bale out and land in a vineyard. The Allied forces made their way up through Italy, till later, on a mission around Monte Cassino, Tom was hit by German anti-aircraft batteries and crashed into the hillside. This time he remembered nothing when he eventually came-to on an operating table in a German field hospital with a padre reciting prayers over him. Posted missing, he was a POW for more than a year before he was released in a prisoner exchange early in 1945. Tom, badly wounded, came back. But there were huge losses among the aircrews and ten names on the Ponteland memorial were aircrew in the Second World War, out of a total of twenty four names. They too were very young.